2010 is the hundredth anniversary of the Boy Scouts of America. 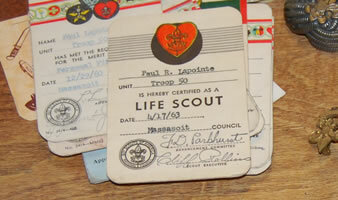 I became a Scout on its fiftieth. Aaron becomes an Eagle Scout on its hundredth. Perhaps it is a good idea to visit the beginning. The following are direct quotes from the fourth edition, printed in 1911, of the original British handbook. I have collected these here to honor and, hopefully, to entertain Aaron. Congratulations! Every boy ought to learn to shoot and to obey orders, else he is no more good when war breaks out than an old woman, and merely gets killed like a squealing rabbit, being unable to defend himself. People say that we have no patriotism nowadays, and that therefore our empire will fall to pieces like the great Roman empire did, because its citizens became selfish and lazy, and only cared for amusements. I am not so sure about that. I am sure that if you boys will keep the good of your country in your eyes above everything else she will go on all right. But if you don't do this there is very great danger, because we have many enemies abroad, and they are growing daily stronger and stronger. Therefore, in all that you do, remember to think of your country first; don't spend the whole of your time and money on games and tuck shops merely to amuse yourself, but think first how you can be of use in helping your empire, and when you have done that you can justly and honestly sit down and enjoy yourself in your own way. 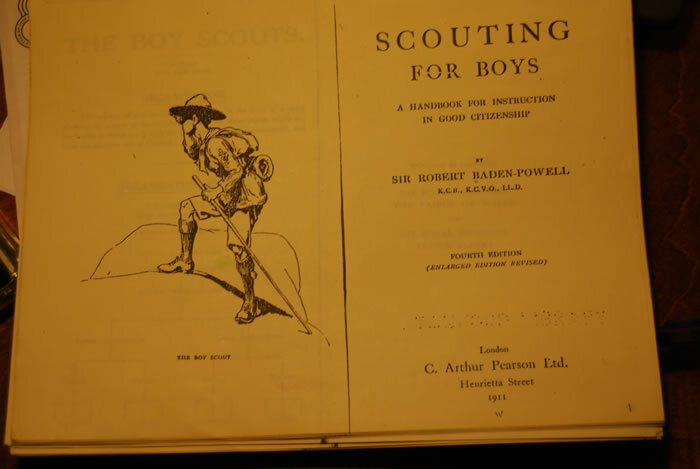 Perhaps you don't see how a mere small boy can be of use to the great British Empire; but by becoming a scout and carrying out the scout laws every boy can be of use. "Country first, self second" should be your motto. A salute is merely a sign between men of standing. It is a privilege to be able to salute anyone. In the old days the free men of England all were allowed to carry weapons, and when one met another each would hold up his right hand to show that he had no weapon in it, and that they met as friends. [We may infer that left-handed guys got away with murder, literally, in old England.] So also when an armed man met a defenceless person or a lady. To salute merely shows that you are a right sort of fellow and mean well to the others; there is nothing slavish about it. Although the war dance and songs may seem at first sight to be gibberish —especially to those who have never had much to do with boys— yet there is a certain value underlying them as a corrective of self-consciousness. 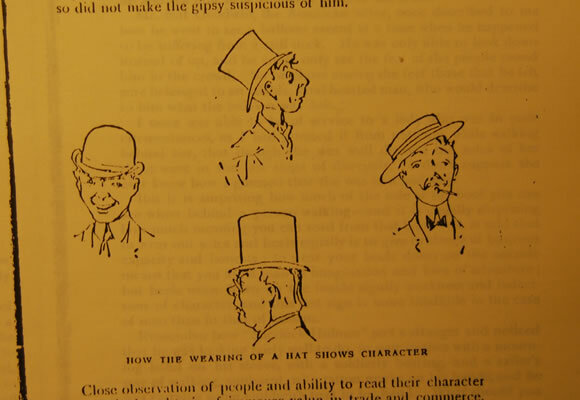 It is said that you can tell a man's character from the way he wears his hat. If it is slightly on one side, the wearer is good-natured; if it is worn very much on one side, he is a swaggerer; if on the back of his head, he is bad at paying his debts; if worn straight on the top, he is probably honest but very dull. 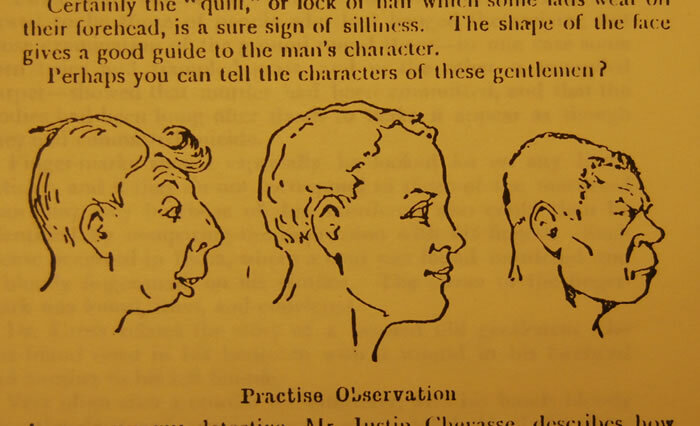 The shape of the face gives a good guide to the man's character. About bees alone whole books have been written —for they have wonderul powers in making their honeycomb, in finding their way for miles —sometimes as far as six miles— to find the right kind of flowers for giving them the sugary juice for making honey, and getting back with it to the hive. A scout's motto is, "Never say die till you're dead." There is no need to take all the drugs, pills, and medicines which you see so temptingly advertised; they often do you harm in the end. It is called "beastliness," and that is about the best name for it. If you still have trouble about it, do not make a secret of it, but go to your scoutmaster and talk it over with him, and all will come right. Practise "scrum' ; also forming a fence with staves for keeping back crowd at fire. Practise holding and wrestling with drowning men. How to prevent a man shooting another with pistol. All of the above are direct quotes.